and Geert Wilders in the Netherlands have already hailed the Trump triumph as an inspiration for Europe, and for the entire globe. Racist xenophobes of the world unite, because its now our time! By sheer co-incidence, this past ten days has also seen the launch announcement of a would-be populist movement in this country. 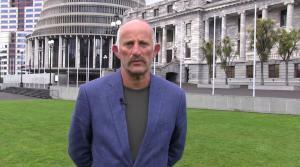 Happily the efforts of economist Gareth Morgan appear to have nothing in common – in tone or content – with the neo-fascist fringe movements that Donald Trump has welcomed in from the cold. Key also said he’d met Morgan around the traps and the economist had always struck him as the kind of guy who’s inclined to take the opposite position to any point being raised. (Subtext: he’s negative, a complainer, and a contrarian by nature.) For good measure, Morgan was also alleged to be “radical.” (Subtext: he’s wacky, crazy, nutso.) Because Morgan will soak up a lot of the available oxygen in next year’s election campaign, Key concluded, he’ll crowd out the ability of opposition parties to make their case, and will therefore affect them more than he will the government. All up, it was a fascinating preview of how Morgan is going to be pigeon-holed once election year 2017 kicks into life. Basically, he’ll be painted as an ego-driven crank with marginal entertainment value, but not someone who should be taken anywhere near as seriously as he takes himself. That line of attack may succeed. Like a few other wealthy would-be politicos who like to think of themselves as no nonsense, straight shooting types… Morgan can be notoriously thin-skinned. (Sir Bob Jones wasn’t exactly a forgive and forget kind of guy, either.) Morgan will need to learn how not to look petulant under fire. A sense of humour would help. And to rebut the criticism that this is merely a one man band/vanity project, he will need to have a team, and allow them to be visible. One significant factor Morgan does have going for him is that doesn’t appear to regard success or failure in ordinary political terms. It seems unlikely for instance, that he wants to lead a small party in Parliament. What Morgan wants instead is to change the terms of political debate, and get his ideas taken seriously. This is a classic nerd’s notion of success: if you can’t make everyone else see it your way, you can at least get them talking about what’s on your mind. While Morgan may not want to join the club in Parliament, his aim to make it impossible for the insiders to persist with business-as-usual. To that end, it would have helped if Morgan had more going for him in the charisma department, but then… maybe that flat, dogmatic aspect of his personality will work for him. As will a climate where – Winston excepted - the main opposition parties will be straining to look like a credible and unthreatening government-in-waiting. In Labour’s case, this means that their policies tend to sound as if they’ve been internally pre-polled and manicured within an inch of their lives. For their part, the Greens have been saddled with the ‘well meaning but naïve’ curse ever since their inception. Even now, James Shaw readily comes across as the guy who has turned up at the front door to take your daughter to the prom. Nice, reasonable and responsible, almost to a fault. Morgan, by contrast, will have the luxury of being able to say what he thinks, without worrying about how any of this may be going down. That might seem refreshing to voters, even when what he’s saying is pretty obnoxious. (That’s the Trumpian part.) In the past for instance, Morgan has sometimes sounded as if wants to put the country’s pensioners on an iceberg and push them out to sea. That sort of thing could help him win the youth vote, fickle though it is. There’s got to be an electoral reward for someone socking it to the boomer generation. On the centre-right side of the ledger… the pickings probably look almost as good for Morgan. During its eight years in office, the Key government has gone through the motions (and the photo ops) of governance, and has managed to keep the majority of voters sedated enough to keep on winning re-election. Ripe pickings for a populist, given that – so far – there’s been precious little in the way of a national debate on the available options. The tantalizing reality is that there are big policy alternatives roaming around, out beyond the campfires of the focus groups. Easy to see why Morgan has begun to think… if not now, when? And if not me, who? As this column has been reporting for months, the top Republicans in Congress – Mitch McConnell and Paul Ryan – have been repeatedly saying that the TPP in its current form is dead, dead, dead. Yesterday, McConnell said definitively (again) that there will be no ‘lame duck’ vote on the trade deal, and that the Trump administration priorities are now tax reform and healthcare reform. ie, dumping Obamacare and passing tax cuts for the rich. So why was our Trade Minister Todd McClay spouting this gibberish in Parliament yesterday, during his third reading speech on the TPP-enabling legislation that New Zealand is still racing to pass, regardless ? Mr Speaker, I will touch briefly on global events overnight. I congratulate President-elect Trump. It is important that we give the new President a chance to put his team in place and consider his trade agenda. This will obviously take some time. We will be able to work with America on trade. The passage of this Bill would put New Zealand, as the TPP Depositary and first to have passed implementing legislation, in a stronger position. Yep, being the first country to proudly pass legislation implementing a pact that the new US administration has singled out for special loathing and contempt obviously puts us in a stronger position. This is like Wile E Coyote pedalling out into thin air, just before he looks down. It's over, chaps. The only way that pressing on with this enabling legislation makes sense is that the Key administration is readying itself to cave into fresh demands when the Trump administration finally gets around to rewriting the TPP according to its whims and desires. Key wants to have all of his TPP legislative ducks in a row when that happens, preparatory to the cave-in. That’s the only meaning one can attach to the plaintive cry of “We will be able to work with America on trade.” Whatever The Donald wants. And here’s a rare recording of what sounds like a policy formation meeting at the Opportunities Party office… Can you dig it, man ?